Created in the 1860s, you can find this ornamental water garden on the north side of park, near Lancaster Gate. The Italian Gardens are an elaborate mix of four main basins. 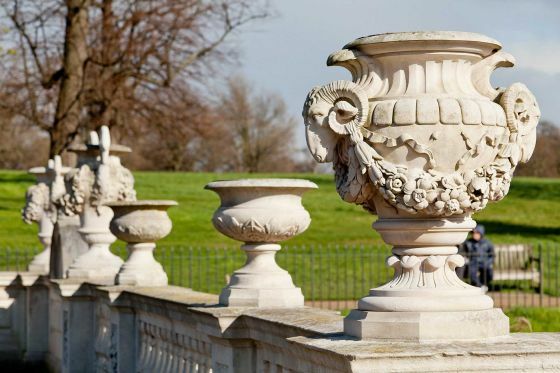 They feature central rosettes carved in Carrara marble, the Portland stone and white marble Tazza Fountain, and a collection of stone statues and urns. See if you can spot the five main urn designs – a swan's breast, woman's head, ram's head, dolphin and oval. The gardens are believed to have been a gift from Prince Albert to his beloved Queen Victoria. They are now recognised as being a site of particular importance and are Grade II listed by Historic England. The layout of the Italian Gardens can be traced to Osborne House on The Isle of Wight, where the royal family spent its holidays. Prince Albert was a keen gardener and took charge of the gardens at Osborne House, where he introduced an Italian garden with large raised terraces, fountains, urns and geometric flower beds. In 1860 he brought the idea to Kensington Gardens. The design by James Pennethorne includes many features of the Osborne garden. Look out for Queen Victoria and Prince Albert's initials on one of the walls of the Pump House, at the north of the gardens. This building once contained a steam engine which operated the fountains - the pillar on the roof is a cleverly-disguised chimney. A stoker kept the engine running on Saturday nights to pump water into the Round Pond, so on Sundays there was enough water pressure to run the fountains. Restoring the original stonework. This included carvingeight life-sized swan heads and necks as replacement handles on some of the urns. Restoring the Tazza Fountain. Fine stone carving was carried out on-site. The central rosettes also needed careful cleaning and some sections were replaced with newly-carved marble. A new planting scheme to recapture the Victorian vision and help maintain water quality. Native water lilies, yellow flag iris, flowering rush and purple loosestrife are rooted in cages just below the water. New walkways help ducks get in and out of the water. A new cleaner water system and water quality improvements. 13 tonnes of silt were removed from the fountain basins during the restoration. The fountains are now fed with fresh water from a borehole. The water is aerated and its temperature raised as it leaps in the air, before flowing out into the Long Water and improving the ecology of the lake. The restoration marks the final part of Tiffany - Across the Water, a project to restore ornamental and drinking fountains across the eight Royal Parks, supported by a grant of £784,000 from The Tiffany & Co. Foundation. 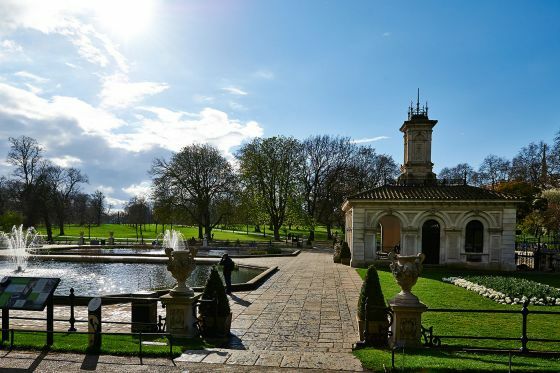 The Italian Gardens are also a star location in several films, including Bridget Jones: The Edge of Reason and Wimbledon.